Dear friends, my heart is beating a little bit faster than normal, in a nervous sort of way! I just hit publish in my Etsy shop and now this pattern is available for sale. I have been coming up with excuses for awhile now why I shouldn't finish this pattern and offer it for sale. Here's a few of my crazy fears/reasons. 1. Some one will sue me because of a mistake in the pattern which makes them waste a bunch of fabric. 2. People will be unable to follow my directions and will call me many terrible names in mean emails and vow to never buy another pattern from me. 3. Everyone will laugh at the notion that I could consider this pattern worthy of selling. I had to write these down to help myself see how they are slightly ridiculous. First of all, nobody sues someone over a bit of wasted fabric, and I honestly don't think there's any mistakes. (or at least nothing major, knock on wood!) If someone hates the pattern, I can always just send them a refund. Sticks and stones may break my bones but words will never hurt me, right?! I had originally written a couple pages about fabric selection and values for this pattern. How to make the most impact with your fabrics, tips on how to make a scrappy version, etc. I've decided to rather put those in a couple of blog posts over the next week or so. 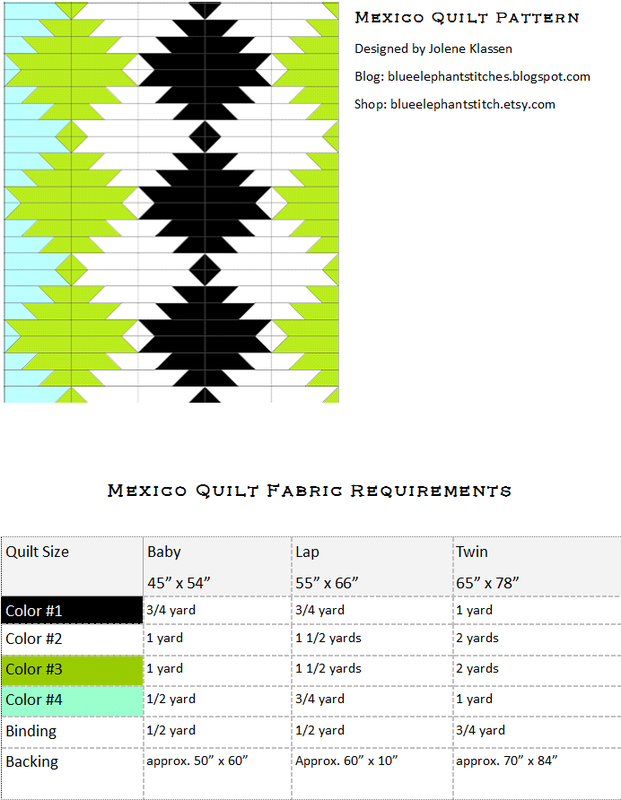 That way I can keep adding updated info here and label it "Mexico Quilt" and anyone can find it! All this to say, the pattern can be found here in my Etsy shop. Jolene I love your design in both scrappy and graphic versions! Glad you took the leap to publish. Check your dimensions on the lap backing size - looks like a typo. It seriously looks great! I really like this pattern and look forward to making it! I am thrilled that you published this! Best wishes for future patterns. This pattern looks great! I especially love that it lends itself to featuring a handful of prints ... I've started to accumulate a few that I love and want to see in large swathes, but don't often see patterns that fit the bill. Congratulations! I had the same fears about publishing my first pattern. I still have those fears with every pattern I publish, actually. I have had some wonderful feedback though, which definitely helps, and I hope it will get less daunting with time. I think your pattern will be a hit! Congratulations on taking the first big leap. I think everyone can agree about all the fears - we are all in the same boat together - but you will be great. It looks great! You shouldn't doubt yourself so much, you are amazing! The first is the scariest! I design paper piecing patterns, but have been working on soem quilt patterns too. don't know if I will publish those, we'll see. Good luck with your designs!!! Great quilt pattern! Glad you quieted your fears and made it available! Good for you! Good for us! Our quilt club just made this pattern for the local Youth Grief Center. Now when I say "quilt group" these are for the most part are new to quilting. And they loved this pattern. It helped them trust the pattern and be surprised by the result of changing the placement of pieces. Ignore the ugly voices and words === for me, I love you and your creativity! I am glad you finally decided to go ahead and publish it. I can totally relate! I have some designs I want to make patterns for, but am scared to death! Like you I'm afraid the instructions will be confusing, fabric will be wasted or not enough and who would want one of my patterns! Way to go and congratulations! I love your design! 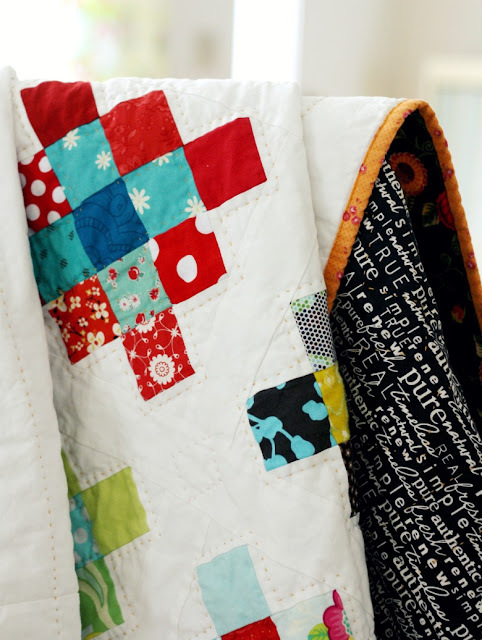 I love seeing your quilts so I'm sure your pattern is just as awesome!! Love the prints and the solids designs:) Good luck!! It looks well done! I'm sure you'll be glad you did it. Congrats! I also am glad to see a pattern that shows the prints! Yeah! Going to make this in twin size for my daughter's bed. I love your new pattern.....and your style and use of fabrics on everything you make. I know it's been awhile, but do remember what the black floral was that you used in your original quilt? Fabric is probably long gone but it is awesome. It is from the collection Greenfield Hill by Denyse Schmidt. It's a few years old, but I think it may be available here and there. Also wanted to say. That I'am such a huge fan of yours. I love your honesty and your humility. You are so great! Can't wait to have a look at the pattern and start sewing. Congrats on your pattern release, Jolene. YAY!!!! Hurray! I'm so glad you took the leap! I made a quilt pattern years ago before I knew as much as I do now about quilting, and people have only said nice things about it. I feel way more scared of releasing a pattern now than I did back then! It's such a great quilt! Hooray, I'm so glad you took that first step Jolene! Your pattern looks wonderful! the pattern looks fantastic! i cant find it in your shop tho. HELP! !